Today’s text is from Judges 4 and 5. We read of two women, Deborah and Jael. The first was a prophetess, Deborah. And the other is Jael. This happened in Israel just after they entered Canaan with Joshua as their leader. After Joshua passed away it didn’t go well in Israel, because they were without a leader, and everyone did what he pleased. It’s sad to see what happened. They had Moses and then Joshua as their leader, but when they passed away they no longer followed the Lord. Many people take their lead from a leader but when that person passes away they no longer follow the Lord. Do you follow the Lord because of someone else or do you have your own relationship with the Lord? It’s a disgrace when your faith lives and dies with someone else. You as a wife, do you only live for the Lord because of your husband or do you have your own relationship with the Lord? God had instructed the Israelites that when they enter Canaan they should destroy all the nations living there but they didn’t obey. For us it’s symbolic that we should destroy all sin in our lives. We do not fight flesh and blood but principalities and powers of satan in spiritual places. It would be terrible if you as a preacher of the Gospel still dabbles in the occult. You will receive a terrible judgement. Whenever Israel sinned God sent enemies to attack them to draw them to Him, that they would cry to Him for help. And so it was during Deborah’s time. God raised up Jabin to attack Israel because they’ve forsaken God. Jabin had 900 chariots of iron and Israel couldn’t fight against them. Fortunately the children of Israel awoke from their sleep, cried out to God for help and confessed their sin. If God warns you against sin and you don’t destroy it, that sin will grow and grow until it destroys you. 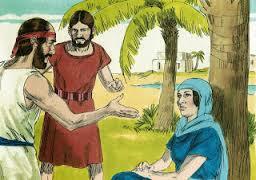 Israel realised that only one thing will help them, that they go to the prophetess Deborah, and ask her for advice. There are problems we face in life that we cannot solve in our own strength. They did well to turn to God. We must take note of this. A true prophet will only tell you what God says. He won’t give you wrong advice. Deborah was a judge in Israel and highly respected. Her life was an example to everyone. They met her while she was sitting under a palm tree. And they told her about the enemy attacking them. She instructed a mighty man, Barak, to fight the enemy. She only spoke to him what God instructed her, and didn’t add her own ideas. And for that reason everyone honoured her. When she spoke they took it as something coming from a judge. But she didn’t lord it over the people. She only passed on to them what God told her. Remember when Israel asked Gideon to rule over Israel, he answered that neither he nor his family will rule over them, but the Lord will rule over them (Judges 8:23). And Deborah did the same. She also didn’t decide to lead the army into battle but instructed Barak to mobilise the army and lead them into battle. But Barak said to her that unless she goes with he won’t go into battle. And so she accompanied them. She also said that she didn’t want any honour for herself or Barak. Neither should they think that they’ve won because of their own strength. God gave them the victory over this army from Canaan. This was a mighty army but Israel overcame them. This is a picture of a Christian facing sin. You cannot be victorious in your own strength. But you can only overcome by the Blood of the Lamb shed on Golgotha. Remember Jesus fought the battle of your sin on the Cross. You cannot overcome in your own strength but if God goes with you, you will overcome. Israel destroyed this army and their leader Sisera escaped on foot to the tents of Jael. We don’t know much about her. She was just an ordinary woman but became a hero when she slew Sisera. She saw him fleeing from the battle, and invited him into her tent to rest, because there was peace between them. He was exhausted. Soon he fell asleep. She then took the tent peg and drove it through his temple and killed him. This is what we should do to our own sin. It is also symbolic of what Jesus did for us on Golgotha. When Barak arrived she called him and showed him the body of Sisera. On that day the Lord subdued Jabin king of Canaan. Barak and Deborah on that day sang a wonderful song of deliverance to God. In this song this woman Jael was praised as a blessed woman (Judges 5:24), the same words the angel Gabriel spoke to Mary! If Jael had hidden this enemy then she also would have been killed. But it’s recorded in history that she’s a blessed women because of what she had done! 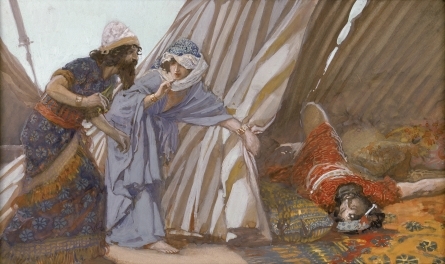 Many whites would condemn this woman for telling a lie and inviting Sisera into her tent. But she had godly wisdom and became a hero because of what she did. Jesus is the truth and if He is not in what you do it’s a lie. What type of woman are you? What type of are man are you? Don’t live like a pig, compromising with the world, but be a blessed, godly woman.